These tutorials are designed to provide you with knowledge and skills to improve every aspect of your camera work. They begin at the absolute novice level and work through to professional operations. They are also applicable to any type of camera work. It doesn't matter whether you aspire to be an amateur movie maker or a career camera operator — the same basic principles and techniques apply to all. Access to a video camera. You should know how to turn it on, load a tape, press record, etc. If you're having trouble with these basic functions, refer to your camera manual or supplier. You can also ask questions in our video forum. Patience. 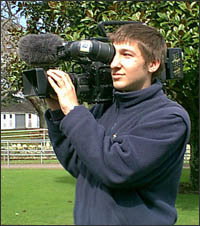 Camera work is a skill which requires lots of learning and practice. Initially it won't really matter what sort of camera you use, but one with a good range of manual functions is preferable. You can get choosy about your camera later. Although the only equipment you really need is a camera, if you're serious you might want to consider buying a few extra toys. To get started the best accessory you can buy is a good tripod.